The chain saw whined and dug in for another bite. I inspected the deep wedge carefully and took one last look at my dog-eared copy of ‘Lumberjacking for Dummies’. Somewhere into my final cut the tall tree shivered and then, with sharp staccato snaps it leaned to one side, accelerated in its fall and – with a final whoosh of air – cracked its one-ton bulk down onto the big rock in front of the cabin. Up here at 3600 feet, winter snow is a serious matter. Even though we’re barely into the middle of September, it’s already on the tongues of our cabin neighbors. Big snow year? La Niña, El Niño? Jon, halfway down the road, is putting on a new roof and eying the sky nervously. Warming his hands before a bonfire, he checks out his roof system: how will it hold up under a real mountain snow load? 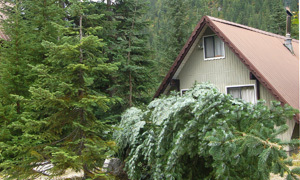 At our cabin, we dig out a patch of snow and send it down the steep slopes to each side. This tree was getting in our way. As I trimmed the side branches and cut rounds from the fallen tree, I felt the hum of its twenty years through my saw: kids shrieking on the low slopes, breaking off the huge icicles that grow from the cabin eaves; late-night visitors arriving on skis to knock snow from their boots; a black bear snuffling the huckleberries; a crazy man finishing the lid of an igloo by floodlight. By the time the chainsaw ran dry on bar oil, the saw dust had plastered my jeans and filled my shoes. I was happy to call it a night. Inside, where it was warm and clean, I had another project going. Since the limitations of our old thin-walled oven always made it difficult to produce a high-rising loaf, I’d brought some quarry tiles up from Seattle, and was eager to give them a try. I was after something real: a Mountain Man kind of bread. I put the quarry tiles onto the center rack of the cabin’s Tappan oven (circa 1970 – in almond) and fired it up. When the oven was good and hot, I bunged in the dough I’d let rise overnight. 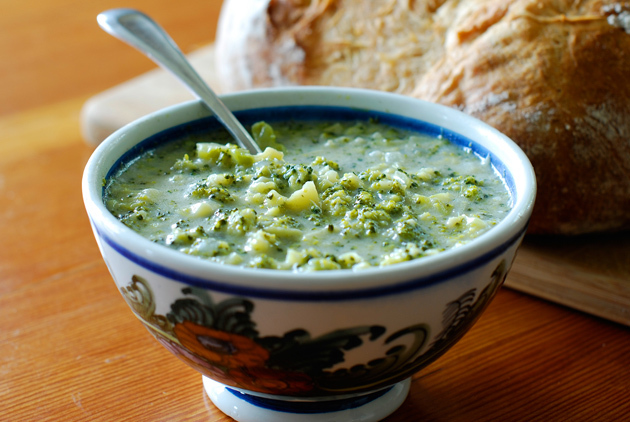 While the bread baked, I made one of my favorite cabin soups – Creamy Chopped Broccoli Soup. And then I put on my comfy slippers, pulled out an Ian Rankin mystery, and sat looking at the darkening hulk of the distant mountains. While the soup simmered and yeasty smells pervaded the cabin, I settled into my Mountain Man mode. Crusty at the edges and a little soft in the middle, like the excellent bread that came out of that old oven. Even so, I reflected, listnening to the fire snap and crackle – it’s all good now, isn’t it? Dry mix 3 cups flour, salt, yeast and sugar in a 4-quart mixing bowl. Pour in the warm water and stir with the handle of a wooden spoon to incorporate. Let sit for half an hour and then knead for 10 minutes on a floured counter. 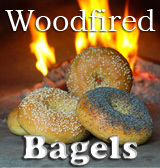 Put the doughball back into the bowl, cover with a cloth and set near the fire to rise for several hours. Barely melt 4 Tablespoons of butter and pour over the risen dough. Work the butter into the dough, and knead on a floured counter. With the addition of the butter, your dough will take in a bit more of the flour. Work for a few minutes until supple. Put doughball back into the bowl, cover with a piece of plastic wrap, and put into the refrigerator to rest overnight. In the morning, take out the bowl, punch down the dough and let sit on a counter for a few hours, covered with a cloth. 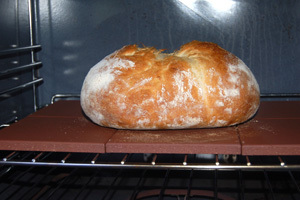 Line a bread basket with a thin cloth (dish towel or cloth napkin) and sprinkle flour on the cloth. Deflate the now puffy dough, form it into an elongated ball, and put it into the lined basket. Sprinkle more flour over the dough, cover with the edges of the cloth and let rise for 1½ hours. Put the rack of your oven one notch below center, and set 6 quarry tiles close together on the rack. Preheat oven to 425º for 30 minutes or more. Cool on a rack for 1 hour before digging in! Using a chef’s knife or Santuko knife, finely shave the outer florets from each head of broccoli, working around to get as many bits off the stalks as you can. Finely chop any part of the stalk that is thinner than your little finger, discarding the trunks. Boil broccoli in 2 cups water in a 1½ quart saucepan for 3 minutes. Remove from heat and use the cooking water in the next step. Melt butter in a 2 quart saucepan, add oil and sauté onions until translucent, about 5 minutes. Sprinkle flour over the onions and stir gently until the flour is saturated. Add ¼ cup hot water, stirring it in until smooth, and then add another ¼ cup and do the same. Stir the rest of the hot water in by ½ cup measures, making sure the sauce is smooth each time before continuing. Slowly add the milk and, once the cream sauce is bubbling, add broccoli, salt, and pepper. Bring the soup slowly to a simmer. Simmer at least ½ hour to mingle flavors. 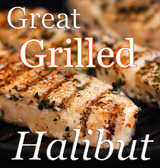 Serve with Mountain Man Bread or similar crusty bread. Sandwich note: With its tight crumb structure, Mountain Man Bread makes a mean sandwich. Once I’d cut and stacked all the wood from that tree and another the next day, I sat in my grubby clothes and devoured a turkey sandwich piled high with lettuce and tomato. If the snow came tomorrow I was ready for it, I thought, as I took another bite. Snow note: To give you some idea of the forces of nature at work in the Cascade Mountains, I’ve appended this photo, taken in February, 2006, during an above average winter. 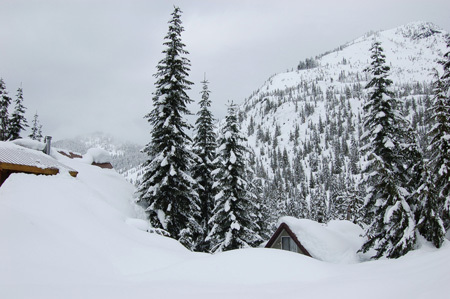 Our cabin’s peak is sticking out at right, under the mantle of some 14 feet of snow! Outstanding writing and cheers so significantly for your time! There is nothing quite like fresh bread and soup in front of the woodstove when it’s cold and crisp outside! This broccoli soup is one of my favorite recipes. thanks for sharing that. I was given a tile that seems very porous and good for baking bread on, it doesn’t seem as though its been treated with anything, no pain, no glaze. so looking forward to try it out. should I be doing anything to prepare it do you think for the first time? also, do you ever use your tiles for pizza, I guess you’d use your WFo for that, but if you did, may I ask how do you clean after? as I’d like to use the tile for both bread and pizza. thank you. I noticed you didn’t score your bread? it still opened up though, thanks again. I’ve got to tell you that I overrode this old oven when I realized that the preheat cycle on it was using the broiler to heat the oven quickly. I did think that the sudden heat might break a tile! So yes, better to bring the temp up slowly, whether for a quarry tile or a pizza stone. Past that, I have definitely used quarry tiles (and pizza stones for that matter) to make pizzas. They really do a fabulous job! P.S. – Cleaning? No worries, just brush the stone with a stiff brush. As to scoring the bread? It’s mostly esthetics. Do you want to eat your bread or look at it? I did this one wrong-side-up so it would look ‘mountainous’! Love this post! Made me really feel like I was there! However what really caught my eye was the broccoli soup I got two heads in my box this week. It looks wonderful and I just have to give it a try! Ah dammit – now why on earth didn’t I marry a mountain man??!! Hey the warm soup and fresh bread are also perfect for keep the insides all toasty. I need to get me some oven stones, but looks like you have a good reason to build a fire oven up in the mountains too! Well said as usual. Still laughing over “Lumberjacking for Dummies.” Once my travel schedule slows, I’m getting myself some tiles and trying out your manly bread! Congrats! You are in Top 9! Congrats on making FB’s Top 9. Also, this Mountain Man Bread looks so good, I think I might make some today…because I seem to have all the ingredients on hand. When does that ever happen? Seems like most things I want to make requires at least ONE trip to the store. Probably not an easy trek for someone who lives on a mountain! wow what a great soup my family will surely love this opne! love the bread! I bought those quarry tiles two years ago and have not used them. I kept fearing something would leach into my bread. Now that I have seen you used them I think I may be courageous enough to give it a try. This soup looks amazing! Broccoli soup has never really appealed to me before, but you’ve completely changed my mind. I really want to give this a try! Oh man! This is why I love fall! That bread looks amazing and I looove broccoli soup! Thanks for sharing..I am definitely adding this to my list of foods to make. This sounds easy but delicious! I’m definitely going to try this! I can’t wait to make this soup. It will be perfect for the chilly days that are coming soon! I love this time of year- it’s the perfect soup weather! I recently made tortellini sausage soup, but your soup looks WAY better! wow! i had experienced something very, very similar to this at shack in the mountains of north carolina years ago. can’t wait to put this together…good memories! Made the soup for dinner and it is fantastic! Thanks for sharing the recipe. Just made this! Didn’t have any flour, but that didn’t seem to matter. Also threw in half a stock cube and a bit of mixed spice for a nice punch. Brilliant! !